This cap is worked flat on two needles, using short-row shaping for the crown, and seamed up the back. 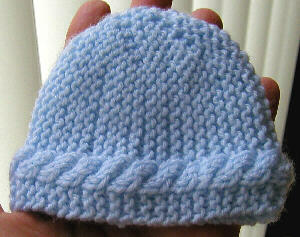 The version given is sized for premature babies; full-term baby head size is 12 to 15 inches. See the end of the pattern for making a larger size. Tip: to work short rows in garter stitch, knit as directed to a certain point in the row and then turn the work around, move the yarn to the back side of the work and knit. This will leave some unworked stitches on the other needle. These will gradually be incorporated in following rows. Try it, you'll see! Row 2: k3, p4, k15, turn work, leaving 6 stitches on the other needle. Row 3: k15, turn cable (that is, put 2 stitches on a cable needle or toothpick and hold to front, knit the next two stitches, then knit the 2 stitches off the cable needle), k3. Row 4: k3, p4, k16, turn, leaving 5 stitches on the other needle. Row 6: k3, p4, k17, turn, leaving 4 stitches on the other needle. Row 7: k17, turn cable, k3. Row 8: k3, p4, k18, turn, leaving 3 stitches on the other needle. Row 10: k3, p4, k19, turn, leaving 2 stitches on the other needle. Row 11: k19, turn cable, k3. Row 12: k3, p4, k20, turn, leaving 1 stitch on the other needle. Row 14: k3, p4, k21. One section of the cap is now completed. Do not break off yarn, simply turn to begin the next section. Follow the short row instructions exactly as in the first section but notice that in the second section the cable turns will fall on rows 1, 5, 9, and 13. Knit a total of six sections, and bind off loosely and cut the yarn leaving a long enough tail to seam up the hat. A gentle overcast stitch with one stitch for each knitted stitch of the hat will be practically invisible. When you reach the top of the cap, run the tail through the bumps around the center hole and pull it tightly shut. Take the yarn to the inside and finish off. For a cap of a larger size or a finer yarn, cast on 30 stitches and use a short row section of 8 stitches (in row 2 leave 8 stitches unworked when you turn). For a cap of smaller size or larger yarn, cast on 23 stitches and use a short row of 4 stitches (that is, in row 2 leave 4 stitches on the other needle when you turn the work). Copyright statement: This is an original design by Judy Gibson, 2006. Permission is granted to print and use this pattern for personal noncommercial use and charity knitting, provided this notice is included. No commercial use or publication of this design--in hard copy or electronic form--are permitted without explicit consent from the designer. Contact: jgibson@cts.com.